Most of us value our ability and freedom to make choices, especially about medical treatment. But what if you lose the capacity to make decisions or make your wishes known? What if important decisions about your health and treatment were left to a physician who didn't know your values, beliefs, or preferences — or to a relative who is equally uninformed? What if you wanted your best friend, who knows far more about you, to make those decisions on your behalf? You can take control of this situation ahead of time through a living will or health care power of attorney (also called a health care proxy form) — documents known as advance care directives. Every adult should have one or both of these documents. How advance care directives work? In a living will, you describe your goals for medical treatment in the event of serious and incapacitating illness or injury, your religious or spiritual beliefs, and any guidance you wish to give regarding your medical treatment in various circumstances. This document guides the people caring for you when you cannot express your wishes yourself. A health care power of attorney permits you to name a health care proxy, or agent — a person who can make those medical decisions on your behalf if necessary. People sometimes worry that by signing one of these documents they give up control over their medical treatment. But that is not true. As long as you're able to make and communicate your decisions, your word supersedes anything you've written or said to others. An advance care directive goes into effect only when you're unconscious or too ill to make your wishes known — and once you recover, what you say takes precedence over any document. For more advice on creating your living will and selecting a health care proxy, purchase The Health Care Power of Attorney and Living Wills from Harvard Medical School. If you decide to change something in your living will or health care power of attorney, the best thing to do is create a new one. Once this new document is signed and dated in front of appropriate witnesses, and notarized if necessary, it supersedes your old directive. To avoid confusion, make sure anyone who had a copy of your old directive gives it back to you so you can destroy it. Then distribute the new one. Take the time to discuss these changes with your doctor and your health care proxy to be sure everyone understands the changes. If you enter a nursing home or assisted living facility, make sure a copy of your advance directive goes with you and becomes part of your medical record there. A growing number of states are creating medical registries in which you may record your directive, so that it will be directly available to health care providers when needed. If you move to another state, check that your living will is still valid. Although states may be legally required to honor any advance directive that clearly conveys your wishes, it's best to verify that your form meets the requirements specific to that state. 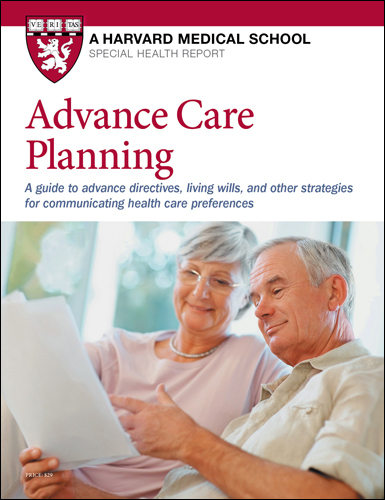 For more advice on creation and maintenance of your living will and other advance directive documents, purchase The Health Care Power of Attorney and Living Wills from Harvard Medical School.